Seriously folks, these things are badly deformed. They’ve got their arms just about fully extended to wave the rest of the platoon forward. And their hands are only just making it above the top of their helmets. This picture comes from Battlefront Miniature’s website here, though I added the commentary. 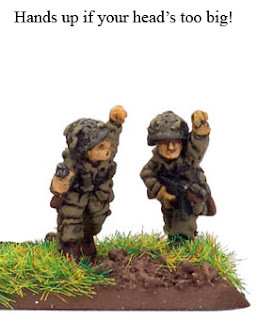 It shows two figures from their US Paratroopers Parachute Rifle Platoon. Their website also has pictures of the accompanying machine gun platoon and mortar platoon. All of these figures are proportioned similarly. Thanks for that. I wonder if anyone from Battlefront is going to comment on that thread. I found the comment at the top of the post quite ammusing!